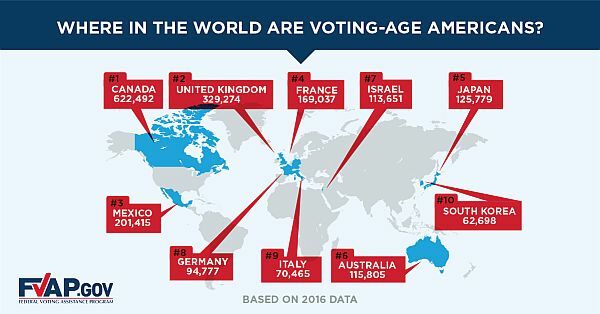 Countries with the highest numbers of voting-age US citizens are Canada, the UK, Mexico, France & Japan. Alexandria, Virginia - Yesterday the Federal Voting Assistance Program (FVAP) released its biennial Overseas Citizen Population Analysis (OCPA) estimating there were 3 million U.S. citizens of voting age living abroad in 2016 who cast approximately 208,000 ballots. The overseas voter turnout of approximately 7% compares to a domestic turnout of 72%. The OCPA examined that 65-percentage-point gap between overseas and domestic voting rates, breaking it into the portion attributable to infrastructure obstacles not faced by voters in the U.S., such as mail speed, versus the proportion attributable to other factors, such as motivation or awareness of U.S. elections. Just over 30 points of the gap were due to obstacles faced by overseas voters. "Our study reveals that the voting rate of Americans living abroad would have increased from 7 percent to 37.5 percent, if overseas obstacles to voting were removed," FVAP Director David Beirne said. "FVAP's advanced methods are providing the most accurate estimates to date of U.S. citizens living overseas and the impact of obstacles on their voting experience." FVAP's survey further showed that greater than 9 in 10 overseas citizens who requested and received an absentee ballot did cast that ballot in the 2016 election. Nearly half (44 percent) said it was the first time they voted in a U.S. election from the country in which they were living. 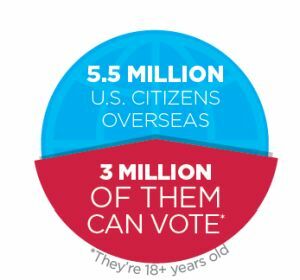 While there is no typical overseas voter, the average age is 46; nearly two-thirds are working; and they are highly educated, with nearly half holding a graduate or professional degree and another third holding a bachelor's degree. For each foreign country and major foreign city, the study estimates the total number of U.S. citizens, how many are of voting age, and their voting rates. Countries with the highest numbers of voting-age U.S. citizens are Canada, the UK, Mexico, France and Japan. Cities with the highest number of voting-age U.S. citizens include London, Tel Aviv, Montreal, Toronto and Vancouver. FVAP's biennial analysis is the most comprehensive source of information on U.S. voters living overseas. It combines data from U.S. and foreign governments, state records of ballot requests and voting, and FVAP's survey of 10,965 registered voters living abroad who requested a ballot for the 2016 General Election. FVAP conducts the OCPA to assess overseas voting participation, monitor how voters are navigating the absentee voting process from abroad, and inform efforts to remove obstacles. More information, including the full report and detailed methodology, can be found HERE. The Federal Voting Assistance Program (FVAP) is a Department of Defense (DoD) organization that works to ensure Service members, their eligible family members, and overseas citizens are aware of their right to vote and have the tools and resources to successfully do so - from anywhere in the world. BN Editor's Note: With the 2018 U.S. mid-terms elections rapidly approaching, the Costa Banderas Chapter of Democrats Abroad Mexico is offering free voter registration assistance in Puerto Vallarta and around Banderas Bay, as well as information to help U.S. citizens register and vote either electronically or by mail from anywhere in Mexico.